It’s time for another installment of Too True Tuesday! Time to share all our embarrassing secrets! This week’s topic: Our secret lists. On a TV show called Friends 100 years ago, there was a couple that had been dating. They each established a list of 3 people they could *ahem* stray with and it wouldn’t count. As long as the person you cheated with was on your list, you got a free pass! In addition, none of the 3 people could be ya’ know, like your neighbors. Or the mechanic down the street. Each person on your list had to be an unattainable celebrity of some sort. Thanks for the explanation, Essie! So, moving on. I’m a rebel. A rule-breaker you might say. And quite frankly, I am not at all visual, like I mentioned last post. Unable to make mental pictures. So the visual hotness of guys I see doesn’t really catch my eye. Given this, celebrities are generally not appealing to me. 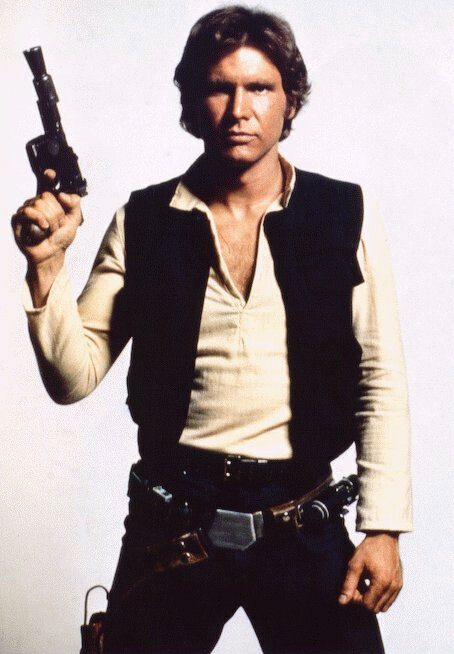 I mean, the only celebrity I’ve ever had any sort of a crush on was Harrison Ford, and that was largely started because I loved Han Solo. But really, that started when I was around 12. And it’s just kind of lingered since then. No serious crushage going on. So if I could pick guys to *cough* play with, no guilt, they wouldn’t be real guys. Remember how I said I am full-on addicted to reading? The first character I’d looooove (*drool*) to..um..spend some time getting to know better is Joscelin, from the Kushiel series. He is this strong, well-built, GORGEOUS man, with incredible self-control and incredible dedication. The kind of guy who will literally fight to the death for the woman he loves. And who is very, very, very talented in the “bedchamber,” as he would call it. Yeah. Him. *drool*. The third..doesn’t exist. I don’t want to pollute my first two with a third. If I’m going to get one off my list, those two are soooo far above anybody else I could come up with, there’s no point in adding a third. Ok, I might have to make room for Edward Cullen. Hmmmm. Uh huh. You just try to keep him. He is soooooo coming with me. You can have Emmett. He’s amusing and cute, but just not my type. At least from the pictures in my head. Nice to have for a brother in law, though. Hey! If you take Emmett we can be sisters (in law)! Wait..just looked up the movie character’s photo. He’s WAY hotter than Edward. Who casts these things?? ?